Cayman Aggressor V the newest member of Aggressor Fleet, launched in 2018. Divers can make up to 5 dives per day, all diving is from the mothership. Sharks, turtles, stingrays can be spotted, as well as famous Cayman wrecks like Kittiwake and Doc Polson wrecks. For the excellent relaxation, Cayman Aggressor V offers a shaded sun deck with a jacuzzi. 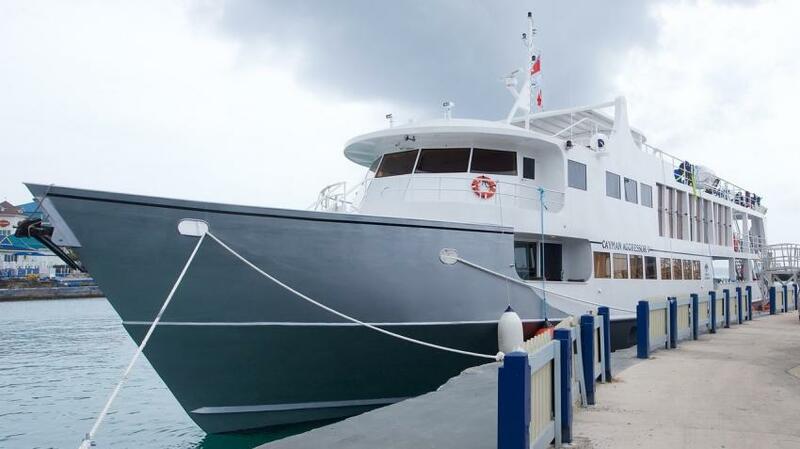 The boat has 10 cabins for 20 guests. All are equipped with private showers and air conditioning. Eight staterooms located on the lower deck three cabins with twin beds and four deluxe with convertible beds, that can suit either for double occupancy or for twin share. Upper deck cabin has big panoramic windows with a gorgeous sea view. These have convertible beds as well. Cayman Aggressor V has a big indoor salon with a sitting area and entertaining facilities. There is also an outdoor relaxation area. Boat’s guest can enjoy the amazing view while they are relaxing in a jacuzzi on the upper deck. The boat was built according to divers requirement. She has all necessary equipment on board, including two air compressors, a nitrox membrane. All dives will be made from the mothership that is very convenient. You can prepare for the dive on the spacious dive deck with boxes for the gear storage and hanging area for wetsuits. Cayman aggressor is the best choice for photographers. Here they will find a complete photo center with camera table, charging points, computer for editing images. Photo equipment can be rented with the prior notification. You can also get certified as a marine photographer on board. Aggressor fleet cares for the diver's safety. The boat has firefighting equipment, an emergency raft, and life jackets. Dive instructors and divemasters are trained and certified by international recognized certification agencies. Each receives proficiency training and annual inspections to review safety aspects. Cayman provides a wide range of fish life. Lobsters, turtles, eagle rays, jacks, and snapper can be spotted. Sometimes reef sharks visiting Cayman dive sites. Wrecks of Cayman Islands bring many divers to this destination. Kittiwake, Ore Verde, Doc Poulson, David Nicholson once sunken here and now divers can explore them. Wrecks also serve as a home for many juveniles. The Cayman Islands is a year-round destination. An average water temperature through the year around 26-28C/78-82F. June through October is the hurricane season in the Caribbean. The visibility of water exceptional. Looking into the depths epic. Good diving with the exception of not having enough mooring buoys to dive multiple dive sites (many repeat dives). Usual Caribbean marine life but, still lots to see!